It was a real honour to have a chance to co-present a show leading off the second incarnation of the wonderful TONE Festival. Even if there can be unexpected shifts in a lineup from planning to execution, I was very excited with the night that came together. 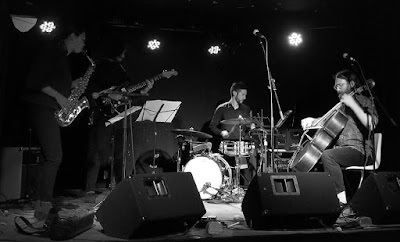 The heart of this show was this reunion set from Clarinet Panic, reactivating on a planetary alignment that had all four members in the same city for long enough to get a grip on Cory Harper-Latkovich's quick-shifting chamber-prog. Hearing the velocity and intensity of this music again was a reminder of how much more "rock" it is than most "new music" — especially with saxophonist Karen Ng finding the same fast-squawking tone used by Linsey Wellman in art-punks FET.NAT. * So far as I can tell, this set-long piece is an extended redux of this older composition, though I don't know for sure if it still bears the same name.